Everything you need for your little bundle. 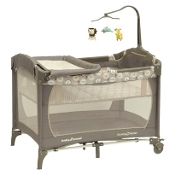 Includes Pack N Play Nursery, Cradle Swing, Monitors, Bouncer, Play Gym and Bath Tub. Save $18 on the bundle. Substitute items will be allowed.